"Mens Sana" roughly translates to "Sound Mind" in latin. The purpose of this project is to raise awareness and money for a cancer charity that has not only changed my life, but most importantly my little sister's life throughout her cancer treatment. Often during cancer recovery, or recovery from anything for that matter, a crucial aspect of recovery is forgotten; to smile. The newly built dining hall funded by donations, which allows for more campers! This camp is one of the charity organizations I am doing this trip for. It's a summer camp in California for kids who experienced cancer and their siblings. All of the activities the camp offers are adapted so that even kids with physical disabilities, like my sister, are able to do everything someone without any physical impairments could do, without reducing the fun factor. Since 1987 over 36,000 kids were able to attend. The very minimal fee's allows for all families to be able to afford it the priceless experience. This is more than just another camp for kids to spend a week away from home for most kids, it is their second home. Many families travel far from home and spend several weeks or months to get treatment for their seriously ill or injured children, a long time to be away or to divide a family. And, for children facing a serious medical crisis, nothing seems scarier than not having mom and dad close by for love and support. A Ronald McDonald House is that “home-away-from-home” for families so they can stay close by their hospitalized child at little or no cost. My sister Noah and our mum after returning from Vietnam. When my little sister Noah was 10 years old she was an exceptional athlete. Even though we were in Beijing at the time our school sent her to places like Vietnam to compete and she would always bring a plastic bag filled with little holes and medals back home. Obviously my mother and I did shake our heads quite a bit at her innosence. Our whole family in bed after Noah was discharged, though she was still going through Chemotherapy at the time. The very same week she was diagnosed with Medulloblastoma, a relatively rare type of brain cancer, she went from competing and training to not even being able to lift her arm. She had two surgeries within a week's time and did not even talk for a month afterwards. Due to the location of the tumour, all of her movements and the general control of her body were greatly impaired. She was completely devastated. Noah in the hospital, smiling for a picture with the legend Jonah Hill, though she was too young to know who he is from any of his movies. She still has to do physical therapy every single day, or else she might miss her chance for recovery. She understands this, yet every single day she throws a temper tantrum whenever we tried to get her to do physical therapy. Until one day Noah and I came back home from camp and she told our mother "mum I want to be able to walk by myself at camp next year." 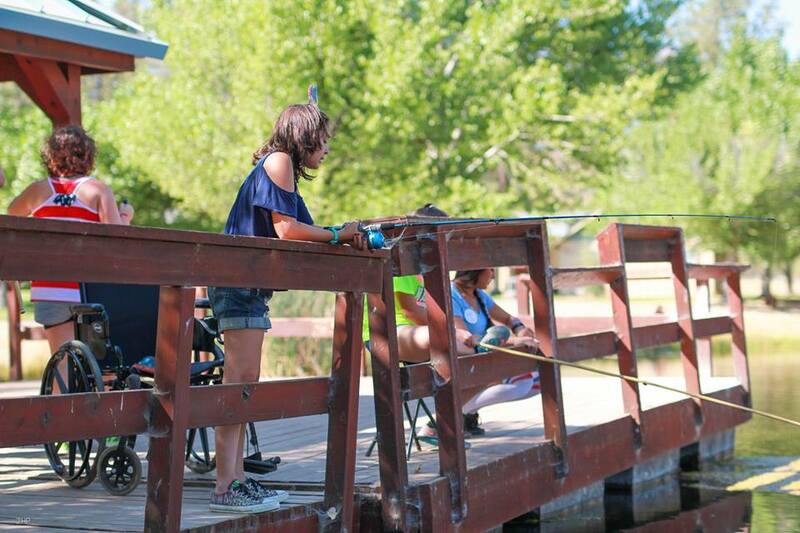 Noah standing up by herself while fishing at camp, her cabin ended up setting a new session record. The camp is more than just some other summer camp for my sister. It is one of the only places where she felt safe and accepted, where she could do all the activities that other kids could do, because someone took the extra step to make sure everything is accessible for kids with physical disabilities like my sister. She could do archery with the rest because of the bow stand, she could climb the towers because of the extra safety features, and she could go anywhere anyone else could because of the heavy duty wheelchairs. She was happy there. But most importantly, she wanted to improve, all by herself. Do not underestimate the power of a smile. Noah at camp with her counsellor goofing about.